Recently on a wine tour, one of the other members was an employee of Dan Murphy’s. After talking to him and discussing the brands Woolworths owned, I decided I should at least try them, I mean I’m aware they’re not doing the wine industry huge favours pushing wine out at low price points, but they are still buying grapes, employing winemakers, vineyard workers and supporting the economy. 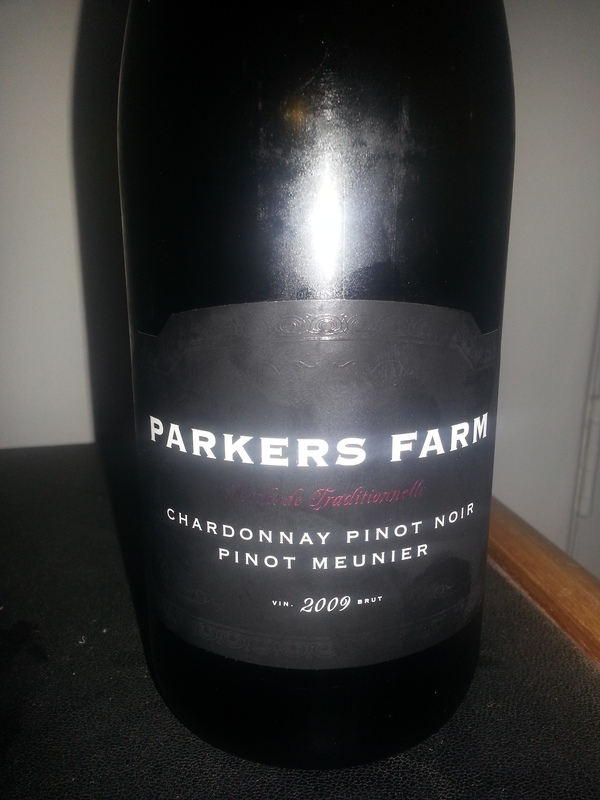 Parkers Farm is one of Woolworths many labels that they’re producing wine under, I think the key was Pinacle Liquor, there is also a list available here. Firstly – sealed with a crown seal? Really? Because there’s nothing more romantic than opening a bottle of wine with a bottle opener keyring. Admittedly it’s probably going the way of amazing Stelvins but hopefully they come up with something closer to a Stelvin than a beer bottle. The wine had lemon to gold colour you’d expect with the mix of varieties in it and the age. I’ve read many articles and comparisons of how wine ages under Stelvin but nothing about how it ages under crown seal, I guess someone will do it sooner or later. It would be interesting to compare wine under Stelvin to under Crown seal, anyway back to the wine. It was like they put the wine into a soda stream. Just pouring it I could tell from the way the mousse rose in the glass, this was not going to be a nice wine to drink. As Laura said, quoting Abe from the Simpsons, “the bubbles are burning my tongue” – for those unfamiliar here’s the clip. Onto the taste, it seemed to be a bit unfocused and misc really. I just expected more due to how it was presented, it seemed to try and place itself directly in competition with higher priced wines. However I think the labeling, marketing and the fact it’s vintage is probably why I’m giving it a harder time, but if you want to display something as a premium product then I guess be prepared to back it up. Other wines in this price range would have a similar lack of focus – it’s $10, I mean what can you expect. However as per usual, spend the extra bit and get something nicer, in a similar price range, I easily prefer the Jacobs Creek Trilogy or Seppelt Fleur De Lys Chardonnay Pinot Noir to this. If you’re game or cheap, the wine is available online here, or in Dan Murphy’s stores. Hahaha! That is one to avoid, not sure I like a burning tongue with my wine! « What impresses me in Cellar Door Employees?